All the studies conducted showed improvement in the quality of meibum but also in the compression of the meibomian glands. This improvement will last: About a week after the initial treatment. Two to three weeks after the second. Between 6 months to 3 years after the third session. Notes: The total score of the 10 single symptoms were defined as the total symptom scores. (Dryness, Foreign body sensation, Itching, Burning, Visual Fatigue, Blurred Vision, Sensitivity to light, Watering, Secretion disturbance, Pain). *Compared to the baseline, the total symptom score significantly decreased at the time of D15, D45 and D75 (P<0.01). **Between the visits of D15 and D45, the total score continuously decreased (P<0.01), while between the visits of D45 and D75, no significant difference was observed (P=0.85). The stimulation leads to the Meibomian glands returning to their normal function in a very short time (a couple of hours) following the treatment. The treatment effects last 6 months to 3 years after the 3rd to 4th sessions. 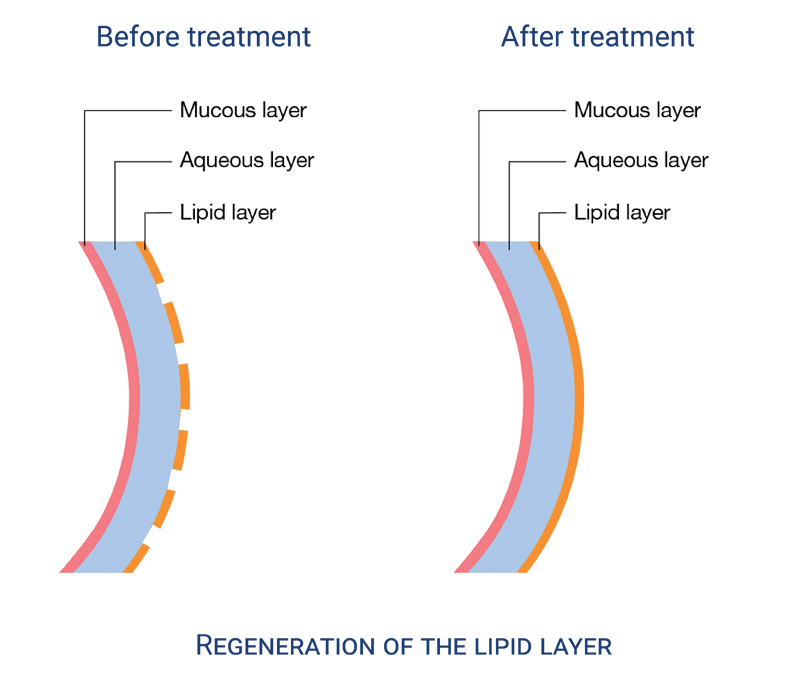 In 60% of cases, effects persist beyond 3 years after the treatment. According to the Oxford scheme (0,I, II, III, IV), patients with lower grade (1 and 2) are “easy” candidates that go down from 1 to 2 grades after the first 3 sessions. Dr Christian Malbrel, Ophthalmologist in Reims, France, undertook a clinical study in 2012 on 150 patients with MGD. Results show 90% satisfaction rate after a serie of 3 treatments on day 1, 15 and 45. Associate Professor Jennifer P. Craig from the Ocular Surface Laboratory within The University of Auckland’s Department of Ophthalmology, has published results of a prospective, double-masked clinical study using E-Eye technology for the treatment of MGD. This study has been published in the Association for Research and Vision in Ophthalmology’s (ARVO’s) journal of Investigative Ophthalmology & Visual Science. Significant improvement in the Non-Invasive Tear Break Up Time (NIBUT) in the treated eye but not in the control one. Significant improvement of the tear Lipid Layer Grade (LLG) measured with a TearScope. 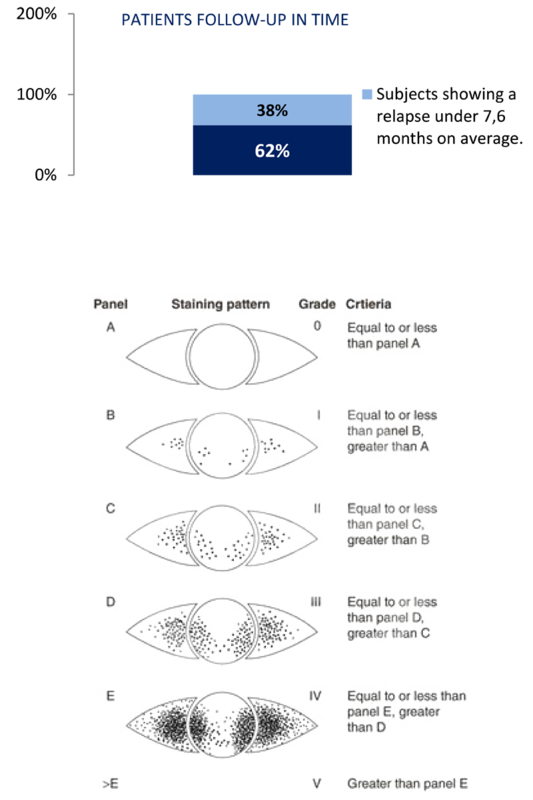 86% of participants noted reduced symptoms in the treated eye (SPEED score). Figure: Non invasive tear break-up time of the treated and control improved from BL, with only one eye treated, bodes well for eye at each of the four visits. Non invasive tear break-up time was higher at D45 relative to BL in the treated eye (P < 0.001), but not in the control eye (P¼ 0.56). Additionally, NIBUT was signiﬁcantly higher in the treated eye compared with the control eye at D45 (P < 0.001). *Signiﬁcant difference between groups at P < 0.005. Error bars denote SEM. 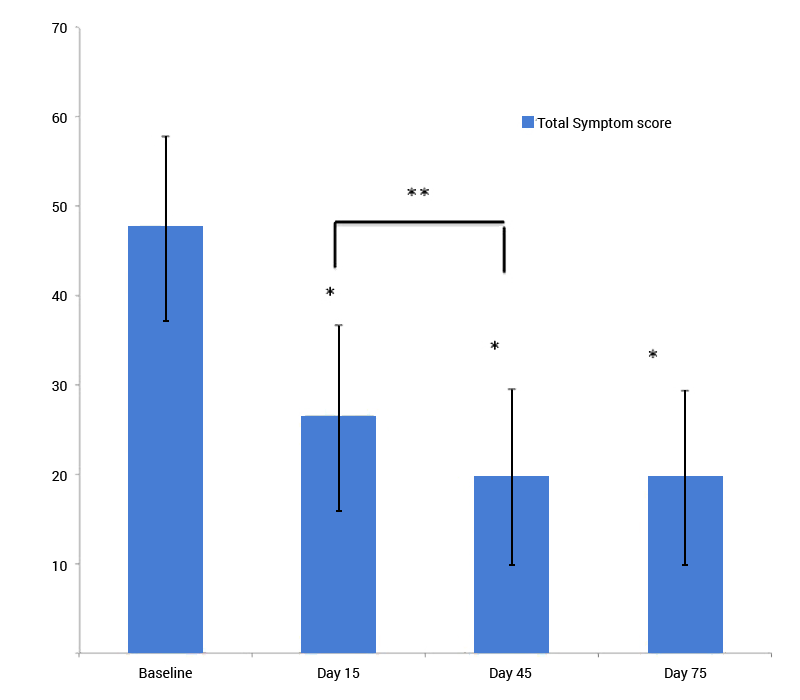 Evaluation of the safety and affectiveness of the Controlled Discharged Xenon Flash Lamp (IRPL) device in the treatment of Meibomian Gland Dysfunction caused dry eye. 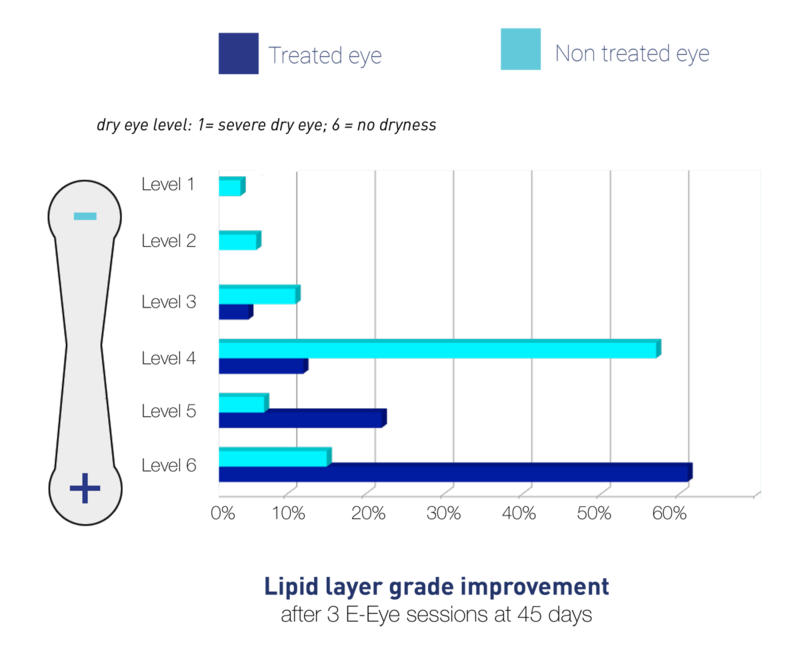 Using Controlled Discharge Xenon Flash Lamp device treatment (energy level 13.0J/cm2), the dry eye symptoms were significantly relieved in patients who suffered from dry eye disease caused by Meibomian Glands Dysfunction . The morphology of the palebral margin, the meibomian gland opening obstruction and the meibomian gland quantity were also improved. The difference between prior and post treatment was statistically significant. In addition, the Controlled Discharge Xenon Flash Lamp device therapy could improve the tear film quality, and prolonged the tear break up time. Following 4 consecutive treatments, the improvement to the dry eye symptom and the sign of the ocular tissues could be well maintained. 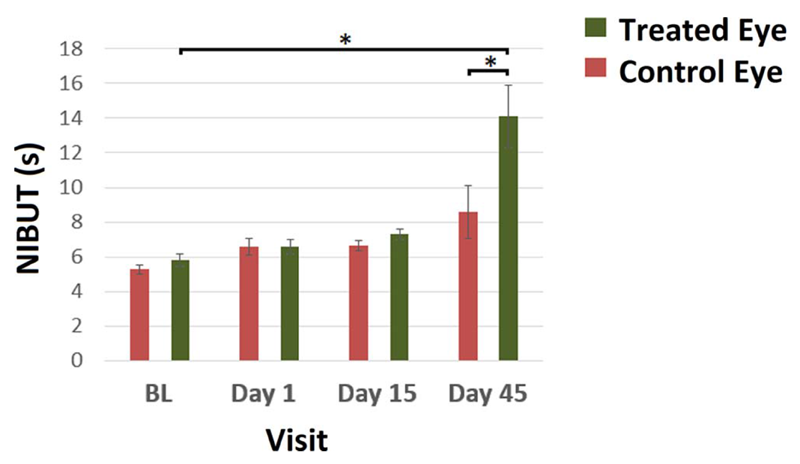 Overall, this study had demonstrated that the Controlled Discharge Xenon Flash Lamp device treatment is safe and effective in the treatment of dry eye caused by Meibomian Gland Dysfunction. Dr Christian Malbrel ran a second clinical study in France on 55 patients who were treated early 2012 with a surveillance over 36 months. 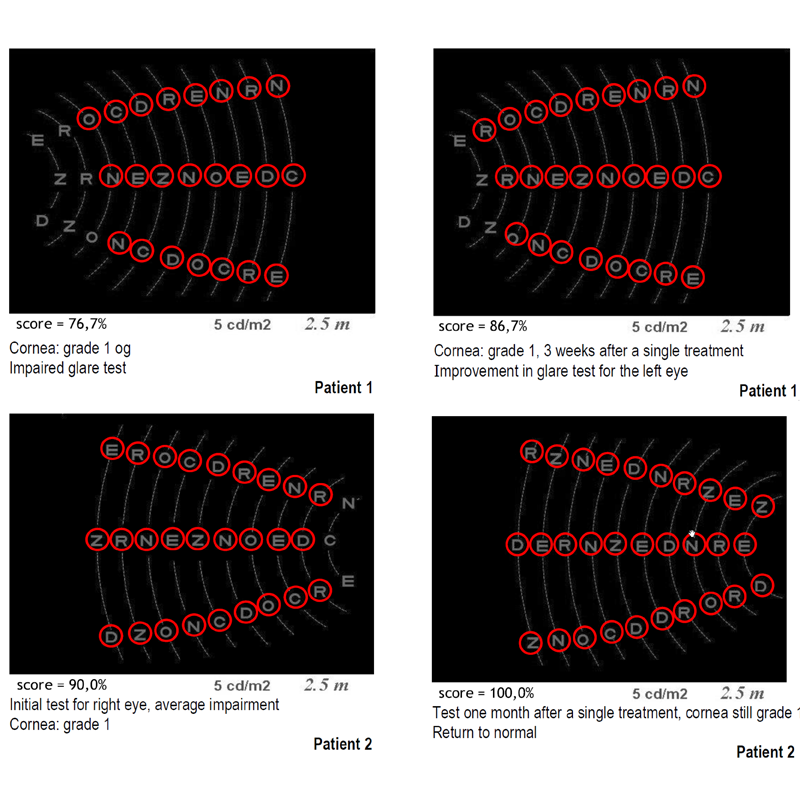 Each patient received on average three E-Eye sessions. The clinical study reveals that 62% of the patients didn’t experience any recurrence after the initial treatment during this period. 38% of them had to complete an additional session 7.5 months after the initial treatment. The average gap of surveillance without having to give another treatment was 29.3 months. Sofia, dry eye sufferer from Sydney.